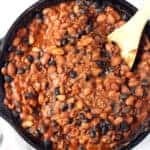 Easy BBQ Baked Beans that are comforting, slightly sweet, mildly smoky, rich, meaty, and totally indulgent. Serve these at your next barbecue and they’re sure to be a hit! 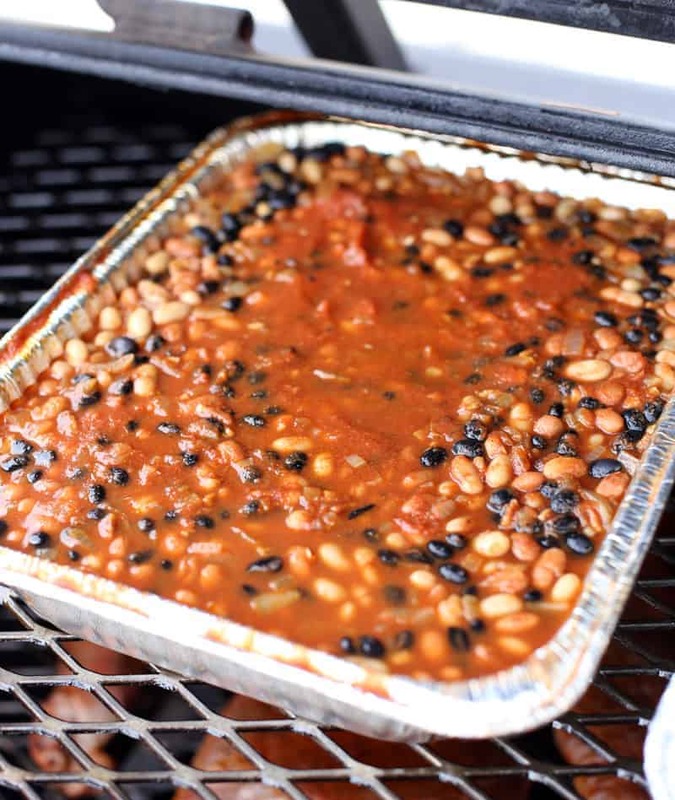 One of the very first recipes we served to our friends at the inauguration of our first smoker was BBQ Baked Beans. At the time I didn’t really know what I was doing. I followed a few recipes and picked the items that sounded good, then threw a bunch of stuff in a pot and hoped it would turn out okay. And you know what? It wasn’t too shabby if I do say so myself. But much like my first BBQ sauce I made a huge rookie mistake. I used liquid smoke to achieve that smoky flavor. That’s something we do not use anymore. Why? Because the flavor of most store bought liquid smokes is, frankly, terrible. It gives an artificial smoky flavor, rather than something that can be achieved naturally, from your smoker. I didn’t realize this until we started experimenting and comparing the differences. 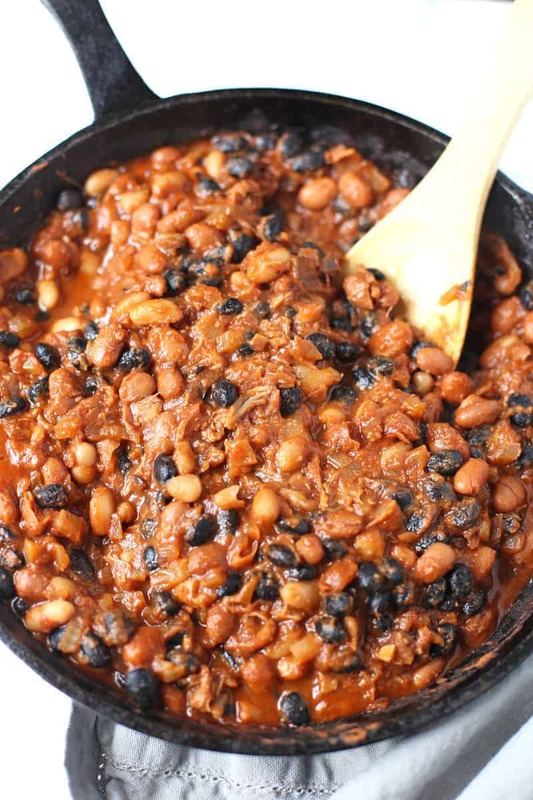 This recipe is also made entirely without the help of store bought canned “baked beans”. I’m a little shocked to see how many recipes are out there that use canned baked beans (that are already overly sweet and high in sodium) that they just “jazz up” by adding more sweet stuff. If that’s your thing then by all means, keep it up. But I like knowing exactly what goes into my food, and I’m not a fan of overly sugary beans. These beans aren’t too sweet or salty. They have a nice balance of meaty, savory, sweet, and smoky flavors. I like a combination of three different kinds of beans — kidney, white (great northern beans to be specific), and pinto. But black beans work well too. I start the beans on the stovetop. If you have a range on your outdoor grill or smoker you can easily do that there. But I like to cook down the bacon, onions, and garlic to get them going, then add in the other ingredients and let them all simmer where the molasses adds that depth of flavor and smoky richness. Then I transfer the pot (or pan, or dish, or whatever you want them to cook in, just as long as it’s oven safe), to the smoker to continue cooking and developing those delicious flavors, and soaking in some of that natural smoky goodness. 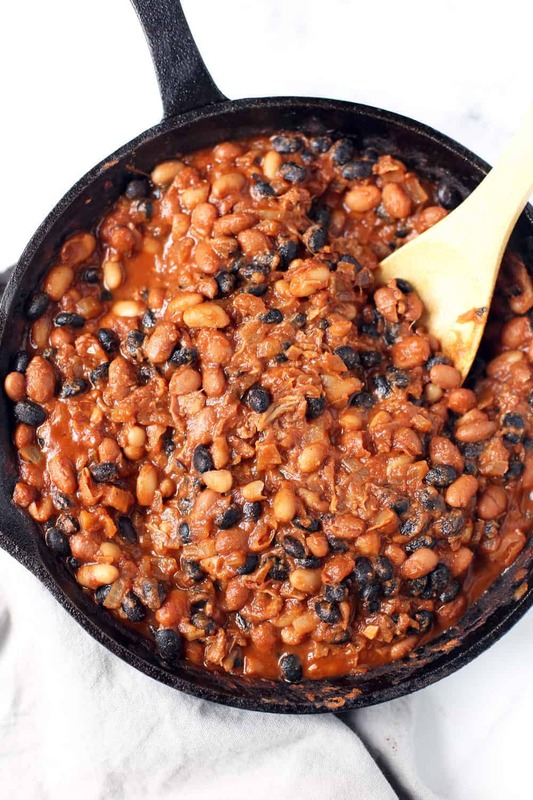 Today, baked beans are still a favorite that we serve at events, but it’s all homemade and naturally smoky. Comforting, slightly sweet, mildly smoky, rich, meaty, and indulgent. So good! 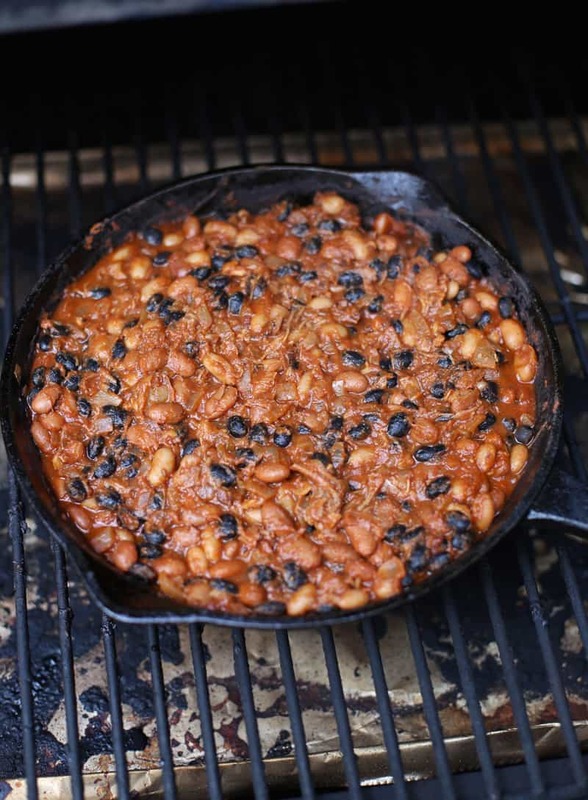 Can I adapt these Barbecued Baked Beans? YES! The nice thing about this recipe is it’s totally adaptable! You can add or take out whatever ingredients that don’t float your boat. Don’t want to use bacon? Fine. You can use pancetta. Or if you have any leftover brisket or pulled pork lying around (don’t judge!! ), then heat up some brisket in place of the bacon. These beans are so stinkin’ good with brisket! You can also use leftover pulled pork. You can even make them vegetarian by leaving out the meat. We always cook a vegetarian batch when we serve these beans at events. Speaking of events, this recipe is easily doubled or tripled for a crowd. We start it on the stovetop (like mentioned above) then transfer into a large aluminum baking sheet (as seen in the photo above) to cook on the smoker. The type of beans you use are also up to you. I like a combination of three different kinds of beans — kidney, white (great northern beans to be specific), and pinto. But black beans work well too. You can even just do one type of bean if that’s all you have. Want to make it a little darker? Add a little bit of coffee to the pot. Want them a little sweeter? Add more brown sugar or a couple tablespoons of maple syrup. Want some kick? Add a few dashes of hot sauce or red pepper flakes. You can even add in a couple tablespoons of your favorite BBQ sauce to jazz things up. It’s up to you. But this is how we like ours and I’m sticking to it. 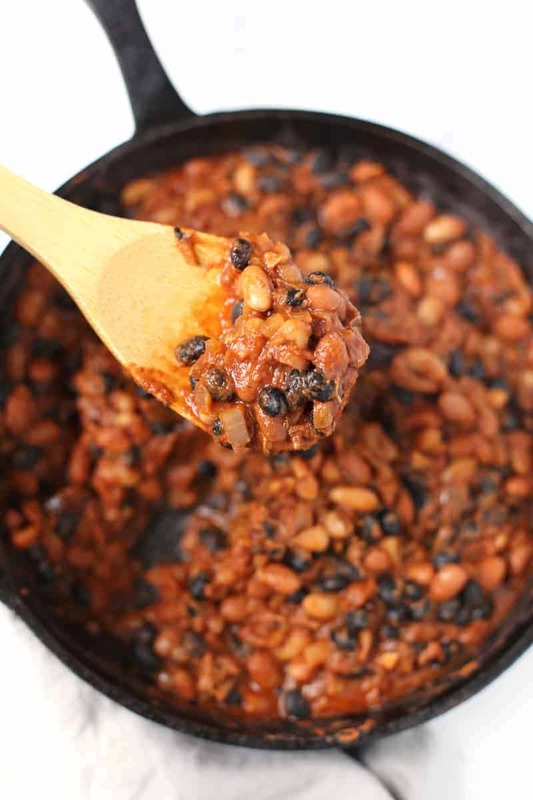 Easy barbecued baked beans that are comforting, slightly sweet, mildly smoky, rich, meaty, and totally indulgent. Pre-heat smoker to 275 degrees Fahrenheit. In a large oven-safe pot, cook the bacon over medium heat about 5 minutes, just to render the fat and crisp up the bacon. Remove the bacon (set aside for later) and discard most of the fat (saving about 2 tablespoons for the next step). Add the onions and garlic and cook until soft (about 5 minutes). Add the beer and cook down for 1 minute. Add the tomato sauce, balsamic, brown sugar, molasses, Dijon, salt, pepper, beans and the cooked bacon. Mix to combine. Transfer pot onto the smoker, uncovered, and cook for 60 minutes until they are thick, rich, and well combined. Stir on occasion. If they start to look a little dried out, add some water or other liquids (like coffee), in small increments (about ½ cup at a time). What about you? Are you a fan of baked beans? How do you prefer yours? I like the use of molasses in your recipe to add that extra touch of smokiness without just relying on bacon for vegetarian guests! Exactly! And cooking the dish on the smoker adds a nice smoky infusion with zero meat. These look absolutely FANTASTIC!!! I want to dig right in. I can only imagine that the smoked flavor is so yummy and perfectly suited to pair with any BBQ dish! i feel like i rarely (if ever!) 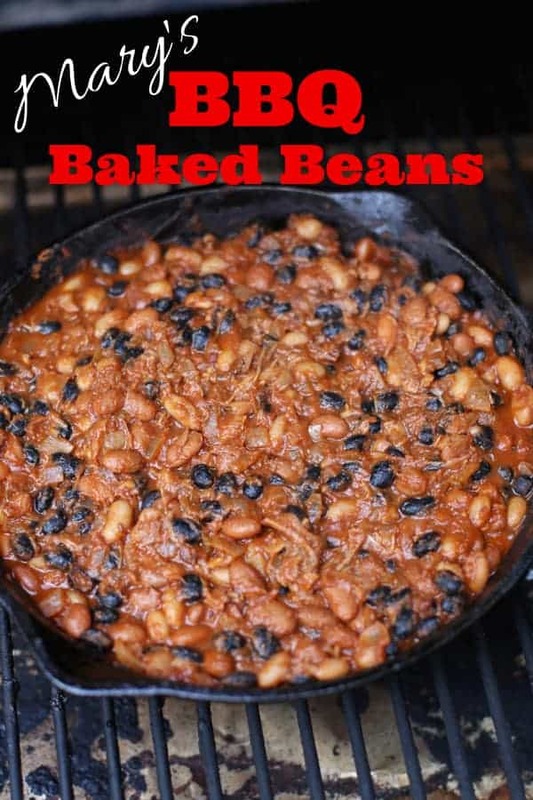 see black beans used in a mess of baked beans, but i would enjoy their presence very much! Oh my! I think I would double up on the bacon rather than leave it out! This looks GREAT! I am going to try it… Thank you. This is exactly how I like my baked beans! I love that your recipe has pulled pork or brisket added.